So, after falling in love with row 1 (in which I think I used and placed colors quite well, if I do say so myself :), the completion of row 2 is giving me pause. I think it's those two middle blocks. Part of the beauty of this quilt is how the whole thing looks like one organic shape, but I'm worried that my use of the white and gold fabrics in the middle there makes it clearly look like two rectangular quilt blocks … which is not supposed to happen. Check, double-check, and then triple-check before sewing and cutting. My comfort level with paper-piecing is increasing (and my number of mistakes and trashed blocks is decreasing) with each block, and at quite a rapid level. 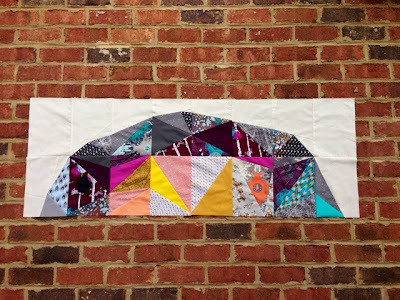 Once you get into a rhythm, paper-piecing (and especially this pattern) is no big deal. However, I still find myself getting in trouble when I try to go too fast … or try to fit in one more block before bedtime. Mistakes take a LOT of time to fix, so in the long run it's easier to pause before any cut made or seam sewn, just visualize the block, and ensure that you're doing it properly. Placing like tones next to each other is a good thing. 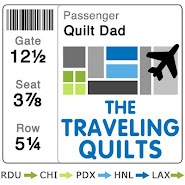 I think this is where I ran into trouble with row 2. I started thinking that each "shard" had to contrast with the one next to it. 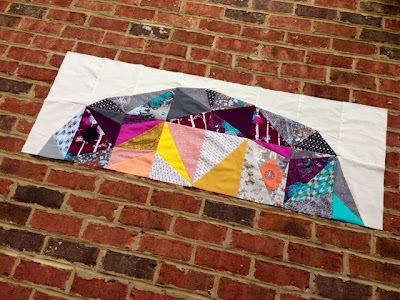 In fact, if you look at the sample quilt (as well as many of the gorgeous examples being made at #sdqal), you'll see that it's often more effective to place two shades of the same color or tone next to each other. This is what adds the 3-D effect, with the change in shade looking like light bouncing off of an angle. I'm keeping this in mind as I begin to tackle row 3. "Made" fabric is not a bad thing! There is nothing worse than sewing a seam, trimming the seam allowance, and flipping the paper over to see that the piece of fabric you cut does not cover the shape it's supposed to. No big deal! Get creative and sew another piece of fabric -- either of the same color / print or a new one -- big enough to cover the shortage. In the end, it just looks like another "shard" in the meteor. What about you? What lessons are you learning as you get into this pattern? Share your learnings with your fellow quilters in the comments below! It's time for our firs #SDQAL giveaway! 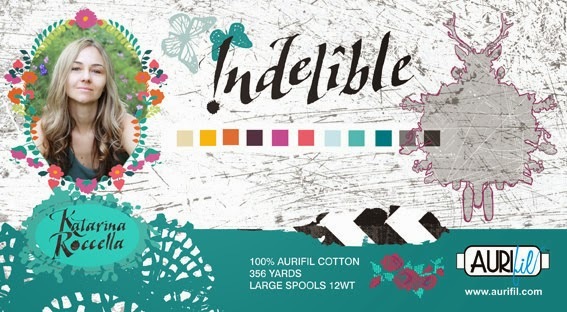 Big thanks to both Aurifil Threads and Kela at Quilter's Square for providing a box of Indelible-inspired threads from Auriful. Drawing from the colors of Katarina Roccella's collection, these threads will be a great addition to any #SDQALers collection. To win, post a picture of your Space Dust quilt completed at least through row 2 over on Instagram, and be sure to tag it with #SDQAL. If you're not on Instagram, post it anywhere that you normally post pictures -- your blog, Flickr, etc. Then come back here and leave me a comment letting me know where to find your photos. The winner will be drawn randomly from all quilt-alongers who have completed at least through row 2. Looking good. I think the thing that I was surprised about as I got into the pattern was the amount of symmetry in the pattern. Every line at an edge of a block lines up with a line in the neighboring block. Its pretty beautiful to watch the patterns within the patterns unfold and it is giving me lots of ideas for quilting. Loving the pattern so much I may just have to make a second! Yours is looking great! I know what you mean about that spot in the second row. Something about the shapes in those two blocks makes it do that in almost all of them I've seen, whether or not they use similar or contrasting colors there. And they all seem to resolve it with the addition of row 3. You can find my photos on IG @thecolorfulom. Gorgeous top John! I have posted my pics on Instagram @tinines - but I am private, does that make a difference? I posted mine on FB here https://www.facebook.com/josie.mcrazie I did put the hash tag thingy on it, but I'm new to all this!! I can't wait to get row 3 on to this! I have it almost finished!! Looks great! I bet your center will fill out nicely as you follow the pattern and it becomes more spherical. I shared mine on IG under Solar Threads. 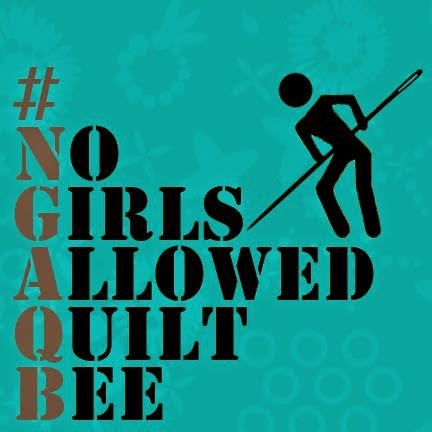 Thanks for organizing the QAL. I've had this on my bucket list for a while, and it was just what I needed to get me going.